Today is the first day of the Business Brilliantly group program. This day has been in the works for well over a year. Matter of fact, if I was being honest, this was a dream that I first had back over 5 years ago. A lot of planning has gone in to today. A lot of work. A lot of energy. I’ve tested what I’m teaching, I know what I’m talking about. And yet? I mean, logically? I know it will all be ok. But logic doesn’t help in this situation. What if every last bit of technology fails? What if no one can access the class? What if I forget everything I know (like, EVERYTHING) and I go blank when the online class starts?!? What if, what if, what if? All of this is a good thing. Completely natural. Being nervous, that is what keeps us ALIVE. My senses are on high alert – I hear every single bird chirp outside, I smell things I wouldn’t normally notice, my body feels like it is humming. My body was built to do that so that I would survive. My nerves are what have helped me make sure that everything is tested and running, working just like I want it. They are also making me feel completely stressed out. Here is where the magic trick that my friend Lisa taught me comes in. Do you know how to deal with the nervous energy? Tell yourself that you are EXCITED. 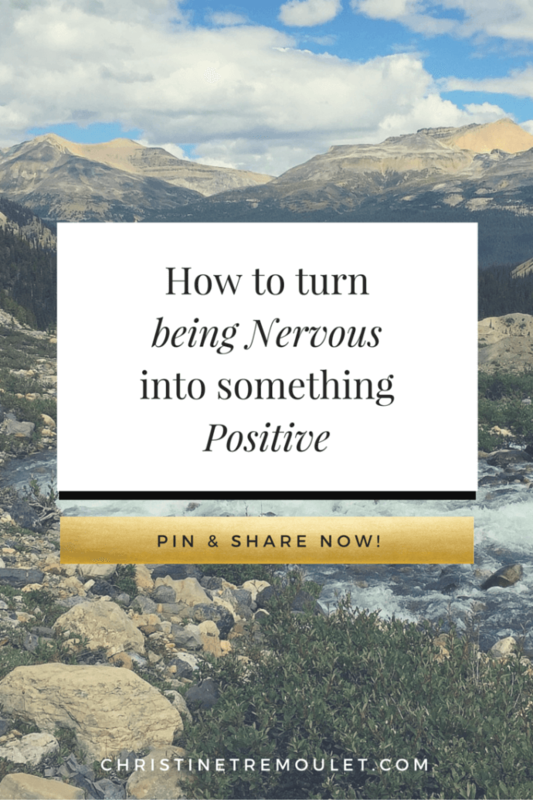 Your body has no way of telling the difference between the feelings of “I am so nervous!” and “I am so excited!” Every time you start to feel nervous? Tell yourself how excited you are! It worked. Every time I do it, it works. My friend Jane reminded me of it this morning. I have nothing to be nervous about. It is just excitement that I’m feeling. Excited, excited, excited. Add to that some power stances – thank you Amy Cuddy for the TED talk on doing those and how body language impacts you, and you’re all set. Now don’t mind me as I stand in my super woman pose and chant about how EXCITED I am over and over – I’ve got a class to teach in a few hours, and I truly CAN NOT WAIT! @christinebpc Generally, I find writing clickbait-style tweets lowers my blood pressure almost immediately. Thank you!!! ❤ I shake like a chihuahua when I am excited! I was trembling in the hospital all night before having my son! Isn’t it incredible how our body looks out for us? I find it so cool that “I’m nervous” and “I’m excited” are the same reactions! I am SO excited to do this, Christine, and you will rock it. I have been looking forward to today since I signed up in November! Sally Benn Clark liked this on Facebook. Chelsea Hutson liked this on Facebook. Well, you’re amazing so I know this will be too! I know I’m just putting a ton of pressure on myself because I want SO MUCH for everyone who is signed up! Over deliver is my BIG GOAL!!! Angie Zeman Dornier liked this on Facebook. Love you too, Lisa! We need to TALK. Soon. I miss you!!! Meredith Harris liked this on Facebook. Spencer Lum liked this on Facebook. Michelle To liked this on Facebook. Rachel Harder liked this on Facebook. Bill Millios liked this on Facebook. Jennifer Dunn Wilson liked this on Facebook. Bianca Williams liked this on Facebook. Toni Coco Warnes liked this on Facebook. Lori Holden Lathan liked this on Facebook. Emma D’Arcy liked this on Facebook. Kendrick Shope liked this on Facebook. Lydia Stuemke liked this on Facebook. Danielle Stasiuk Grace liked this on Facebook. Katya Horner liked this on Facebook. Yehudis Goldfarb liked this on Facebook. Laurie Joy liked this on Facebook. Lynne Newman liked this on Facebook. Hi Christine! I have been trying to access the link you sent out via email and get an error message. Gracie Ruth liked this on Facebook. This is incredible advice! You’d think I’d have learned by now that being out of my comfort zone is a good thing! But nope, still get nervous. I really need to try that “I’m so EXCITED” thing!! Oh no! Did you send an email to support@christinetremoulet.com – that is who can fix it for you! The software company has a bug that they are releasing a fix for tomorrow – so sorry about that! Thanks Christine! I did and it’s all fixed 🙂 thanks again!